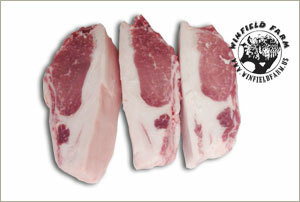 Mangalitsa chops are richly marbled like a prime steak. Shipping of frozen product in gel iced, insulated carton is available to CA, NV, UT, AZ, OR, WA, ID, CO, NM, MT, WY, TX, OK [see Shipping (Pork Products) for UPS Zone rates and options]. Product may also be delivered in the Buellton – Santa Barbara area by special arrangement.